"Doubloon" token, awarded by Dbrant. App article fundraising: We think app fundraising has the most potential in this year’s campaign. Check out the Fundraising in the iOS / Android document to read why. Charlotte and Josh mentioned that there’s a chance that we might be able to have it ready for December. They have to speak to the lead engineers first. 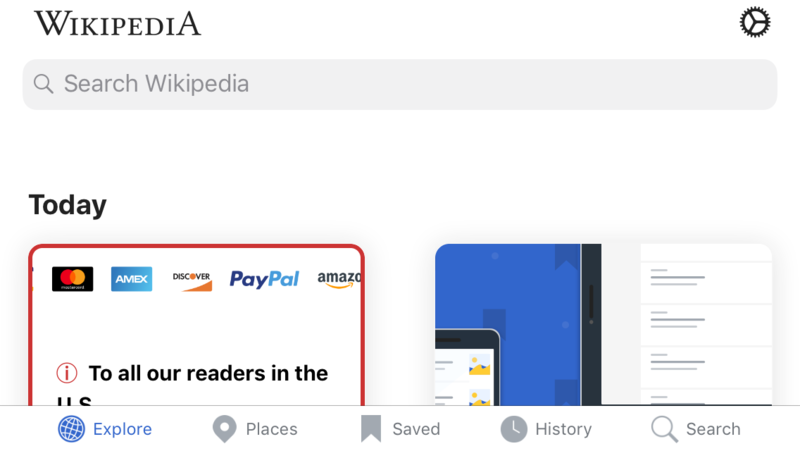 We think that app article banners could use similar copy and styles as used in app feed banners. Here’s a reference link to our current best Mobile article banner (Mobile Small). 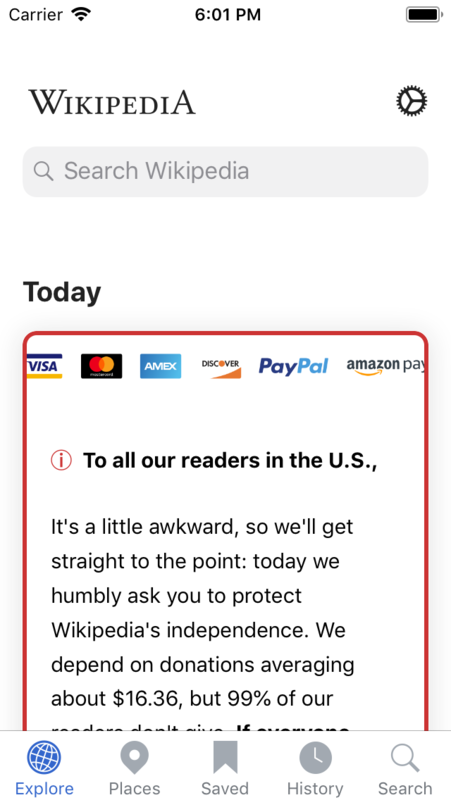 Device variable: In the Mobile Small banner, we’re using the following copy: „It's easy on your phone and only takes a minute.” We know that tailoring the fundraising message to corresponding reader works (weekday, country). Replacing the *phone* part with the reader’s device name (Galaxy S9, Galaxy Note, iPhone, iPad, etc.) will almost certainly be effective. Visual helpers: Our experience tells us, that adding a red border, „information“ iconography, highlighting key copy lines (e.g. a red underline) or adding text hierarchy (e.g. bold title) to the banner helps in raising attention and conversion. A/B testing: As WMF’s A/B testing ambassadors, we’d love to look at some p-values in this year’s campaign. This sounds nerdy and we’re aware, but it’ll give us helpful data that can be compared with Mobile web. In short: The app is an exciting environment to learn from. This could be as simple as A/B testing the 2016 app feed banner with the one from 2017 and/or the 2017 with the overhauled 2018 variant. We've done an initial triage of what is possible for the 2018 Big English time frame. Below some comments/triage. Please note that overall we are happy to push forward fundraising in the apps and work to improve it, but have to balance that with already planned work. 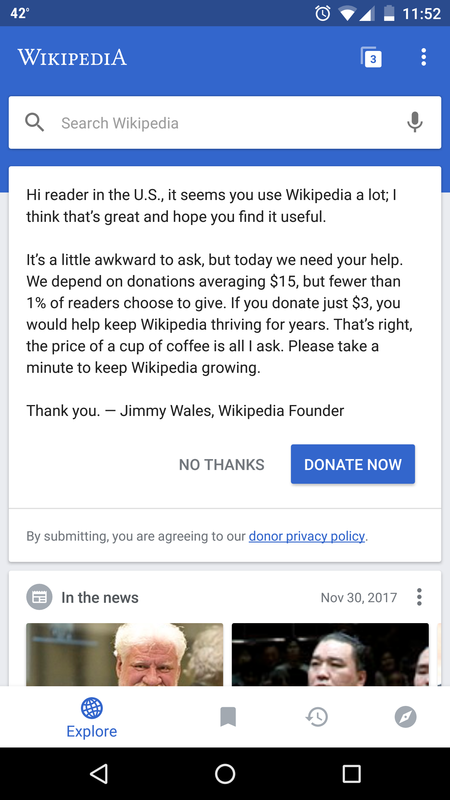 App article fundraising: This is something we are interested in, and can probably make work in a hacky way, even with limited support from CentralNotice, however given the time frame and risk, we suggest we look into supporting this for a smaller campaign in another geography in Q3 or Q4. This will give us more time to figure it out, and make its first test a less vital/risky context. Weekday variable: This is a possibility and we're looking into the details. Visible payment methods: This can likely be done using existing feed banner mechanism, since these are essentially images. We will need to double check that this kind of logo based solicitation won't run afoul of Play Store or App Store rules, but technically seems doable. Device variable: This is similar to Weekday Variable, its something we can maybe support, but needs confirmation/estimation. Visual helpers: Much of this may be possible in the existing banners. @cmadeo can work with your team to determine what is do-able/needed here, but basic HTML formatting should be possible. A/B testing: I think this is going to have to wait for another year. We can sequence test, but parallel population a/b testing is not in place for 2018. Thanks @JMinor for the update, sounds good so far. I’ll sync with Fundraising and explore some directions with @cmadeo in the meantime. Will post updates here. In which timeframe could we get there / what is your estimate to implement it @JMinor & @Charlotte ? Thanks! @schoenbaechler The border round the card is harder than it seems on iOS afaik - @cmadeo can confirm. If the "visible payment methods" are just images then this is fine. What we will need are the finalised designs for the feed card (base them on what we've done before, which I think Carolyn and @RHo have shown you) and then we can estimate at our next grooming. @Dbrant - can you take a look at Robin's initial thoughts (in the ticket description) and flag up anything that he should know to avoid in the design? Similar to what Josh mentioned, we currently don't have a way of displaying banners inline with articles. We currently can only show cards in the Explore feed. 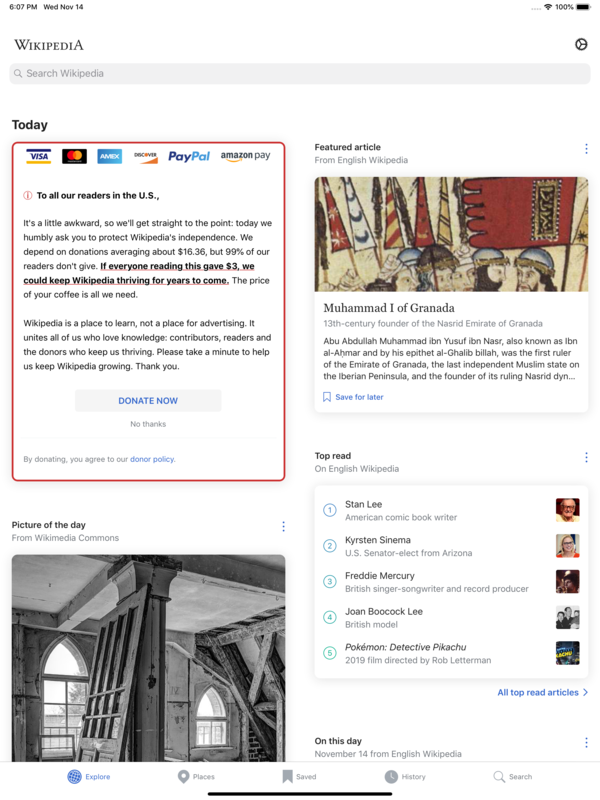 The card that appears in the Explore feed must adhere to the layout seen below (the text can be arbitrary, with limited HTML, and an optional image across the top of the card (not seen in this screenshot)). If we need to make changes to the layout, we'll need to act quickly to release an update to the app so that a sufficient proportion of users receive it before fundraising begins. Thanks for the infos @Charlotte and @Dbrant. I’ve been working on some visuals today. They’re all primarily designed for conversion. I explored three levels of urgency for the app fundraising appeal. Based on our experience in Mobile web fundraising, it can be assumed that android-app-fundraising-03-border.png is going to convert best. It features a red border that has proven to be effective. 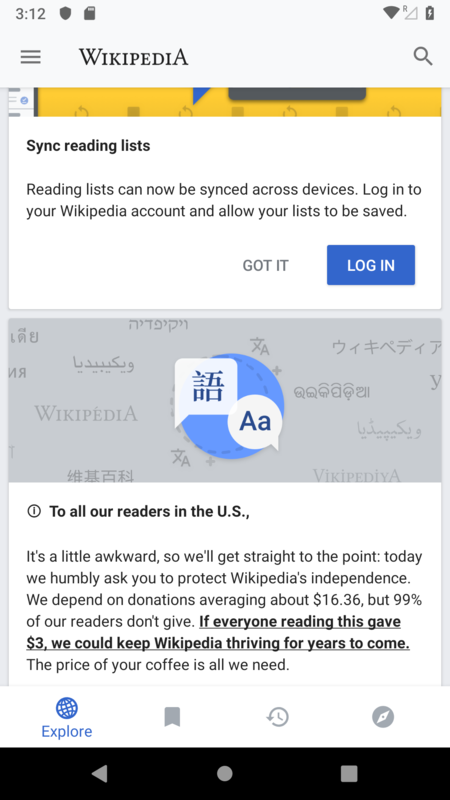 android-app-fundraising-01-border.png is the least urgent version, it doesn’t feature an info icon or underlined text in red. android-app-fundraising-02-border.png is a hybrid and could be the way to go if an inside border of the card is not feasible. 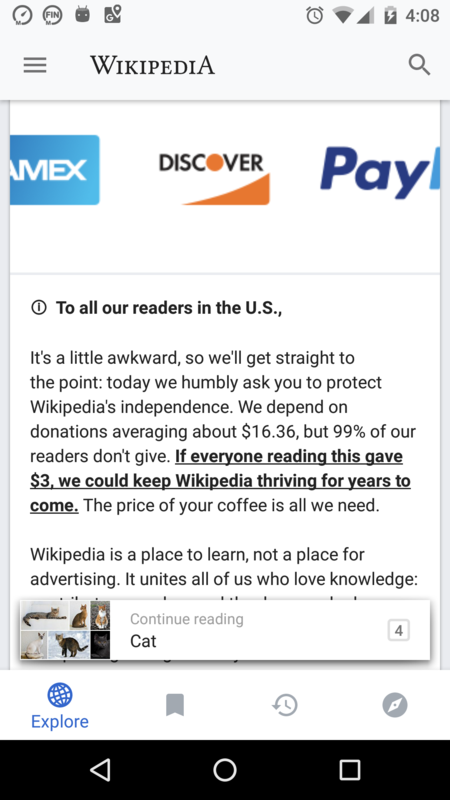 Again, if we’re aiming to create the best converting banner possible, I suggest to go with android-app-fundraising-03-border.png. The question is: is that level of urgency needed or not? Let’s start the conversation @spatton, @JMinor & @Charlotte. 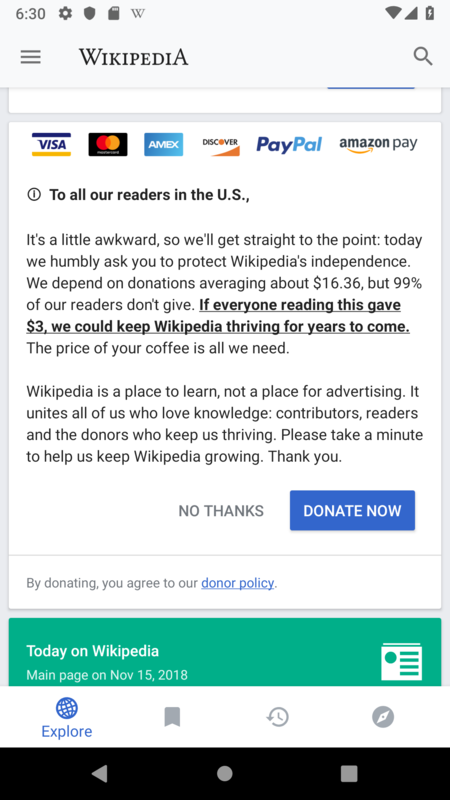 It's a little awkward, so we'll get straight to the point: This Friday we humbly ask you to protect Wikipedia's independence. We depend on donations averaging about $16.36, but 99% of our readers don't give. 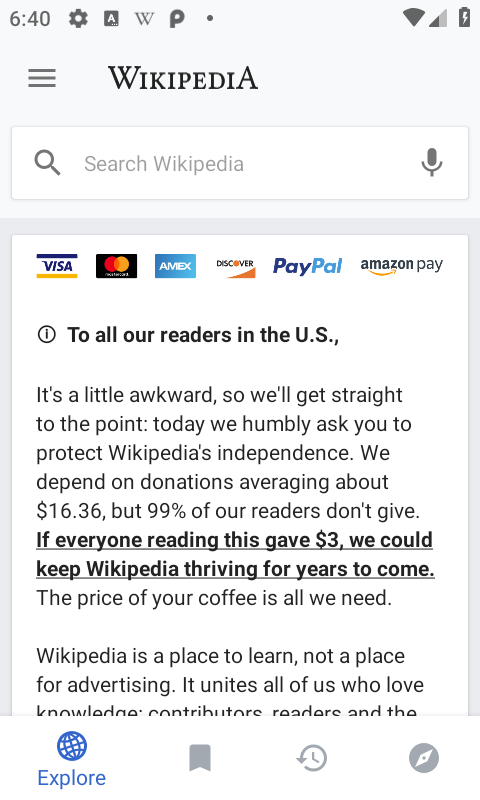 If everyone reading this gave $3, we could keep Wikipedia thriving for years to come. The price of your Friday coffee is all we need. 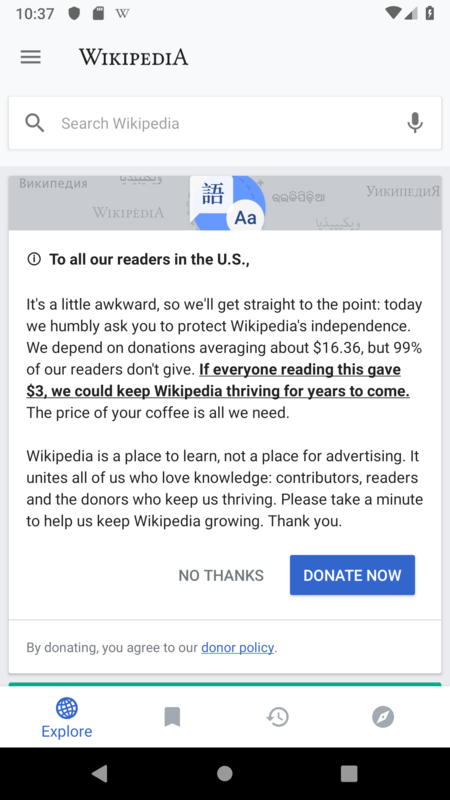 Wikipedia is a place to learn, not a place for advertising. It unites all of us who love knowledge: contributors, readers and the donors who keep us thriving. 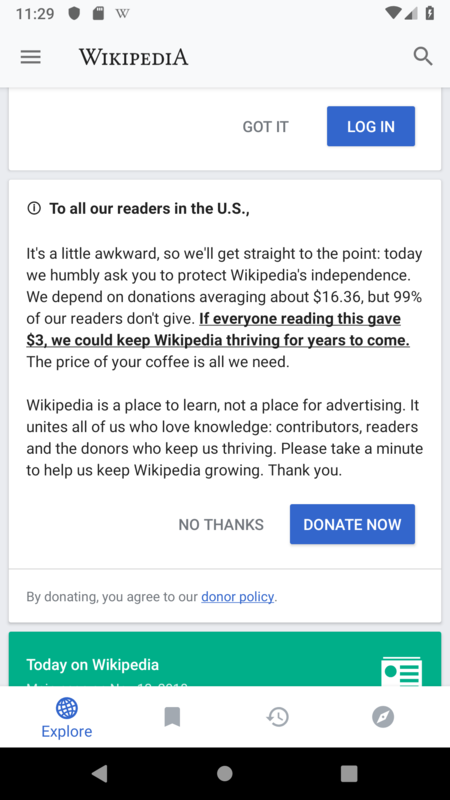 Please take a minute to help us keep Wikipedia growing. Thank you. I can take care in preparing the different payment method images. In terms of design in general, do you see notice any substantial issues on Android in these mockups @Dbrant? @cmadeo: It would also be great to your feedback on the Android designs. And would a similar conceptual approach work on iOS as too or do you see any issues with it? Thanks in advance. Have a wonderful weekend everyone! @Dbrant When you say a limited amount of HTML, does that mean that we're able to insert stuff like the correct day of the week? @Charlotte Nope, the HTML is limited to things like bold or italic text, and not much else. The day of the week is not related to HTML presentation anyway -- the only way to do this would be to have different announcements scheduled for each day, with the correct day stated in the announcement verbiage. @schoenbaechler To clarify a bit further, the screenshot I posted above is quite literally the layout to which we're currently restricted. It's not currently possible to have a red border around the card, or the payment method images at the bottom (we can only have an image at the top of the card), or the "lock" icon in the Donate Now button. Getting the day of the week from the announcement text is problematic since we don't know what time zone the client is in, e.g. Australia vs UK. I think the day of the week should come from the client based on the local time zone. On second thought we could do it theoretically based on the country (and approximating the time zone to 1 per county so we might be off by a few hours but close enough). Still this would bloat the announcement JSON we would send to the clients quite a bit. Agreed, and this can potentially be done by introducing special keywords in the announcement text like $dayofweek, but this would necessitate an update to the app client logic, and bumping the version of the announcements (i.e. AndroidV3) since existing app versions won't know how to handle the keywords. As a side note, does anyone know if this kind of thing is done in CentralNotice? And if so, how? I suggest to run the campaign for the same amount of time as last year and start/end it on the same weekdays. This makes it possible to compare the outcome of the campaign with 2017 as good as possible. How does that sound @TSkaff @spatton @Pcoombe @jrobell? The output of $dayoftheweek in web banners is handled via client side JS, not CentralNotice. @Charlotte mentioned, that it might be possible to make parts of the copy bold and add an underline (e.g. border-bottom: 3px #B32424 solid;) to it. Is that doable @Dbrant? Thanks for this clarification. I’ll explore alternative designs today with the payment methods above the copy. 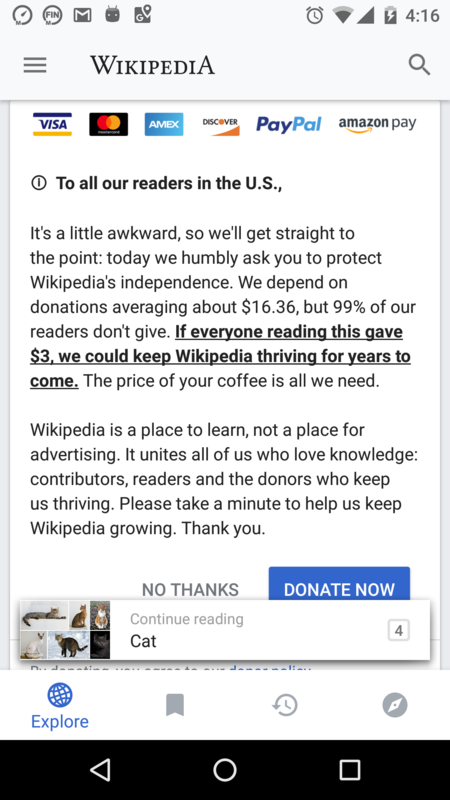 It’s probably not going to work though since the logos usually need to be positioned in proximity to a call to action (“Donate now”). Parts of the text can be bold, underlined, or different colors. However, the underline must be the same color as the text. We might tweak one or the other word in the copy but wouldn’t add any additional variables. Please let us know if you see any problems with this layout or if you need any other infos from our end. 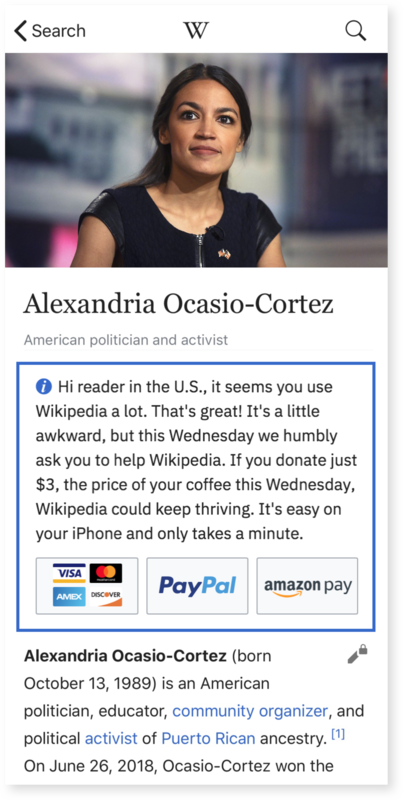 As mentioned beforehand, it features winning elements from Mobile web, such as: info icon, weekday & accurate average variable, red key sentence underline, payment method image and a lock icon inside the “Donate now” button. We’re confident that this is a high performing version of the feed banner. @JMinor: Please let me know about the current project status. Thanks. Older iOS app versions would be shown the same card without any bolding, underlining, or red border. Currently the feed cards are associated with a specific date (eg. if we push the card on Monday, December 1, it will fall under the 'Monday, December 1' header and will be pushed down the feed each day after the first of December). We won't be able to change this behavior for this release, so would it be okay to not include the Weekday variable? 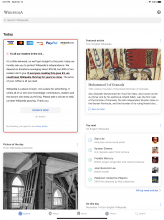 Supporting the credit card images at the bottom would be tricky, as the image scales proportionally with the device and we currently only support banner images at the top of the card. That being said if you wanted to create some sort of background pattern of payment types, we could show it as a top full bleed image to the card. Just noting that the height for this card image is 150pts. Happy to help you with creating this image if you need! Thanks @JoeWalsh for the update, the screens look great. And there it is, the unicode info i! ;) We might try that one in banners too. Since it’s not possible to have the info icon in bold, I think it’d make more sense to have the greeting in just font-weight: normal;. What do you think about that @cmadeo? Yeah, I can see that it could be confusing to have different weekdays in the copy and header. I’m ok with not including it for now. That being said if you wanted to create some sort of background pattern of payment types, we could show it as a top full bleed image to the card. Just noting that the height for this card image is 150pts. Happy to help you with creating this image if you need! A 150pts background image will probably strengthen this effect. Just that I understand correctly @cmadeo; it’s not possible to limit the height of the image, right? (as in the Android mockup above) I remember that Dmitry mentioned, that it might be possible on Android. If it’s not feasible, then I suggest to not include an image at all on iOS. @schoenbaechler - yes on the Android version the image definitely can fit height. @schoenbaechler we can implement the image height restriction on iOS to match Android behavior @RHo on android does it scale to fit or scale to fill? hi @JoeWalsh - the image is centered in the card and scales to fit height. T191640 links to an example image on commons. @JoeWalsh, can we try it with the image below? It’s the US version of available payment methods in an @2x resolution. The actual height is 80px. Based on the specs from Rita it should be centered when the viewport is wider than 520px (the size of the image). The original design suggestion also features a padded border below the payment methods. I’m assuming that this won’t be possible since the image stretches to full width, right? Maybe a separation between logos and copy can be achieved by adding a centered asterism to the image. I’ll explore in case we can’t do border-bottom. On iOS, the image view is scaleAspectFill which means the whole image will be scaled proportionally to fill the entire image view, centering & cropping the larger dimension. I'm not sure now that's exactly matching what Android is doing, but we also have narrower cards for some devices and orientations that wouldn't be able to fit all of the payment types. 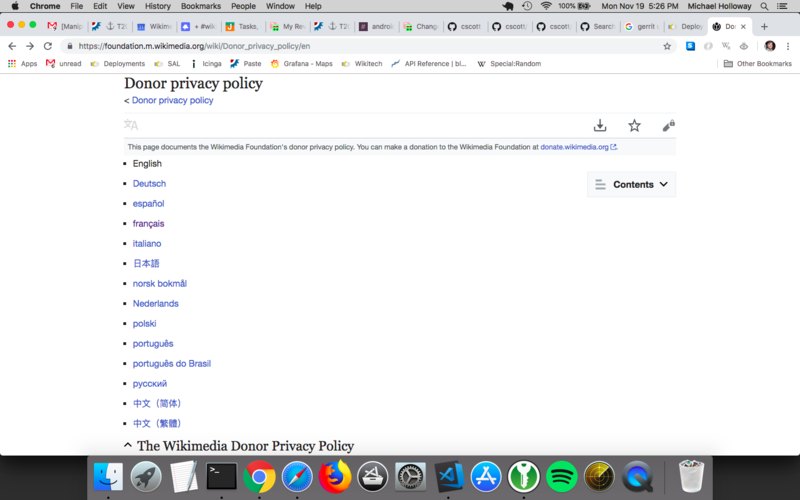 Something like https://upload.wikimedia.org/wikipedia/commons/1/1f/Multilingual_announcement_graphic.png works because there's a large crop-able width and a narrow area of interest in the middle. Thanks @JoeWalsh! Agree, the one on Android seems fine (or a good starting point). Yeah, it seems like on iOS it behaves differently. It should be more of an inline image with a max-height. It currently reminds me of background-image in CSS. Do you think it’s possible to adjust iOS to match Android or is that too much of an intervention? If it’s not possible, it might make sense to just try payment logos on Android. Matching iOS to Android image scaling is going to be too much of an intervention at this point. I'd agree it make sense to just try payment logos on Android for this year. Can we do a border-bottom on the image as in the design suggestion below? (full width border-bottom would be ok too if not feasible with padding on the left and right). The above is on an old Nexus 5 in portrait mode. In landscape it's marginally better but still too big and a little bit cropped. Now checking the URLs, I think we should consider using the mobile (.m) version of the donation policy link. @Mholloway Ok, that makes sense. It's a bit annoying to have to open the section with the actual text, too. So, it's not a clear cut improvement over the desktop URL. I'm fine leaving it as is then. bearND moved this task from To Do to Sign off on the Reading-Infrastructure-Team-Backlog (Kanban) board.